The Oldenburg Municipal Museum (Stadtmuseum) has a number of permanent exhibitions which document the historical development of the city. It gives visitors an insight into the history of art and culture from the baroque period through to the Art Nouveau period, and boasts a stunning collection of antiques. It also focuses on the Oldenburg artist Bernhard Winter. 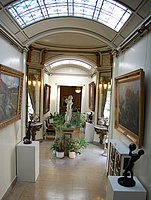 The permanent exhibitions are contained in three historical villas which are architecturally connected. The neighbouring modern exhibition rooms, the Claus Hüppe room and the New Gallery are available for temporary exhibitions. Exhibitions show the work of contemporary artists as well as the political, economic and social history of the city on an area of around 500 square metres. Theodor Francksen (1875-1914) was an avid collector who bequeathed a unique collection to the city of Oldenburg containing a large number of exhibits related to art and cultural history. The Municipal Museum contains a selection of these treasures. When walking around both Francksen Villas visitors are able to gain an impression of the art and cultural history of the city from the 17th century to the turn of the 20th century. The neighbouring Ballin’schen Villa, which also belongs to the collection of buildings which forms the Municipal Museum, contains a collection of the works of Bernhard Winter (1871-1964). He left his mark on the development of art in and around Oldenburg from the end of the 19th century until around the middle of the 20th century. His artistic work was focused on the ideas of the Heimatbewegung, a movement of towards the end of the 19th century aimed at reinforcing and protecting regional identity. After the Bernhard Winter Foundation the development of the city from the 9th to the 19th century is impressively shown by means of six large models of the city. Paintings, militaria and graphics also illustrate aspects of the military history of Oldenburg since the city renaissance after the so-called "Danish Era" (1667-1773).